As the Wayne E. Chapman Chair in Psychiatric Oncology, Holland is a pioneer in the ways in which counseling, psychosocial interventions, and medications can reduce the distress experienced by cancer patients and their families. Her research is especially focused on psychotherapy for elderly patients with cancer. Holland is the first chair of Memorial Sloan Kettering's Department of Psychiatry and Behavioral Sciences, and the founding president of both the International Psycho-Oncology Society and the American Psychosocial and Behavioral Oncology Society. Her work has been seminal in alerting oncologists to the psychosocial needs of patients and to the evidence-based interventions available today. 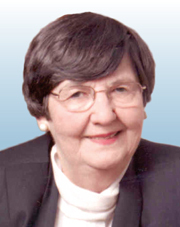 The development of a body of literature, an international journal, textbooks, and training curricula resulted in a science of psychosocial care that has evolved from her work and that of her colleagues around the world. To help oncologists easily evaluate patients' distress levels, Holland and her colleagues at the National Comprehensive Cancer Network developed a "distress thermometer" that measures a patient's distress on a 0-to-10 scale, similar to the scale oncologists use to assess pain. If a patient scores 4 or higher on the distress thermometer, it is a signal that the individual should be further evaluated and, if necessary, referred to a mental health specialist and monitored closely.